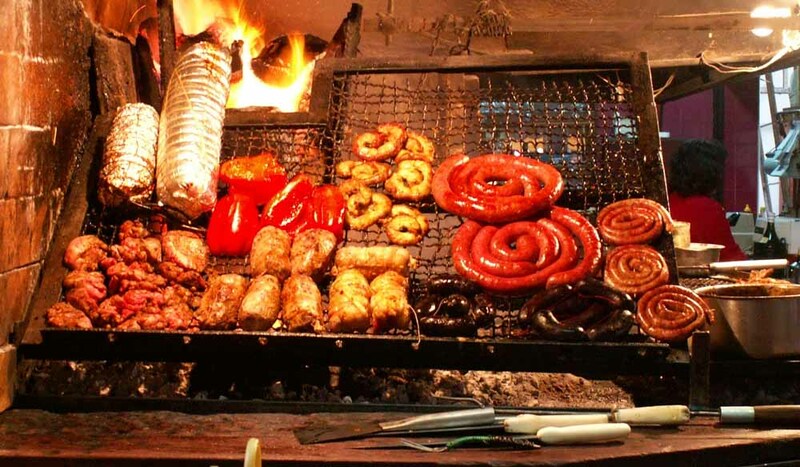 A grill filled with red meats and sausages, Montevideo, Uruguay. Salvo Palace and the Plaza da Independencia (Independence Square). 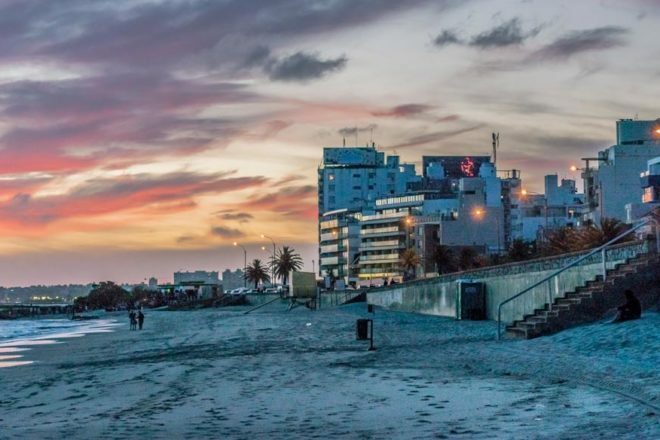 Montevideo, Uruguay. 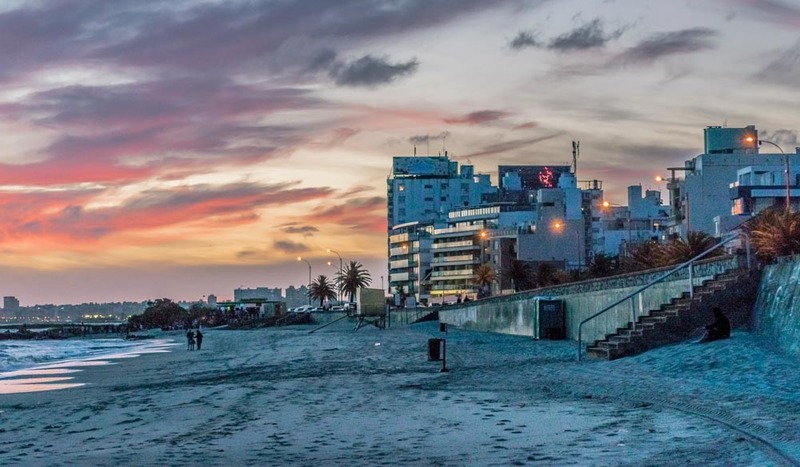 Famous for its liberal attitudes and emerging from the shadow of close neighbour Buenos Aires, Uruguay’s capital is full of Latin flair. An essential stop is the Mercado del Puerto, a cavernous converted market space down at the Old Town’s port. Enter via towering wrought iron gates to find a meat lover’s dream; inside are numerous parrilladas (Uruguayan-style barbecues) plying their trade from open fires alongside wine merchants. The place is filled with the smoke and the intoxicating smell of barbecued sausages, beef and lamb. Pull up a stool at one of the bars with a glass of Chilean red and watch as your steak is flame grilled to perfection. Start the day in the shade of the Palacio Salvo on the stately Plaza Independencia. You won’t have seen anything like it before, an unusual Art Deco skyscraper with Gothic touches that was the tallest on the continent when it opened in 1928. At the end of the plaza wander into the Ciudad Vieja (Old Town) through the original fortress gate, and dip into some of its many galleries. Finish with a stroll along the 22-kilometre seaside esplanade, La Rambla. Try the curious traditional tea-like drink that is mate, pronounced (mah-tay), made from the leaves of the yerba mate shrub. Its smoky flavour is enjoyed from a little bowl made from the hard skin of the gourd fruit and through a metal straw called a bombilla. Its strong caffeine kick has Uruguayans drinking it throughout the day. Experience the hustle and bustle of one of Montevideo’s famous street markets, the Feria de Tristán Narvaja, taking place every Sunday in Cordón. You’ll find everything from antiques to books, vinyl and… pets! To get a feel for uruguay’s national pastime go to the top floor of the cavernous old Mercado de la Abundancia on a saturday night. From a pew at one of the adjacent restaurants enjoy performances of tango with live music, and have a go yourself. In the heart of the Old Town is Café Brasilero (cafebrasilero.com.uy), which dates back to 1877, making it the oldest cafe in the city. Dark timber walls and a throwback charm make it a great place to sit and watch the world go by. For a more contemporary coffee menu and setting head to Coffee Lab Roasters in Nuevo Pocitos. Bit Design Hotel has views of the city from floor-to-ceiling glass, plus sleek bathrooms with rainfall showers. Right on La Rambla is Cottage Carrasco Hotel & Suites, which has rooms with ocean views, a lovely pool, restaurant and bar. 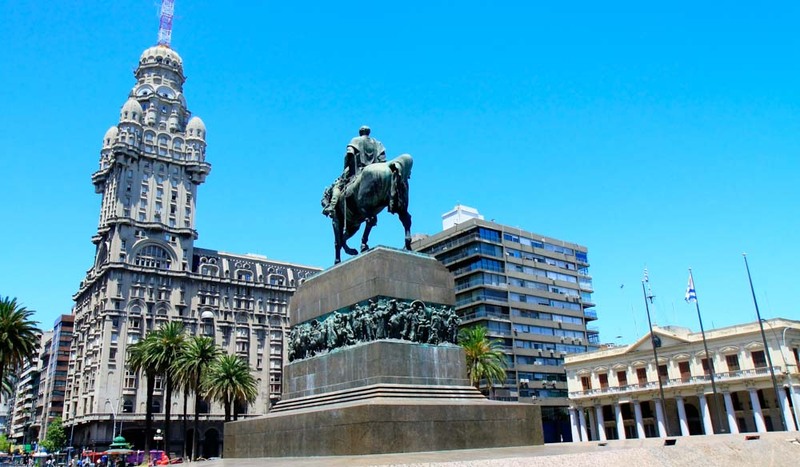 Sofitel Montevideo Casino Carrasco and Spa occupies a national heritage building dating back to 1921. A place to stay after a night at the opera.